Does Steve Wozniak worry about innovation at Microsoft and Apple? What worries “the Woz?” Apple co-founder Steve Wozniak spoke at TEDx in Brussels and shared his perspective as a “gadgeteer” and expressed some genuine and relevant concerns about ownership rights of items we all store in the cloud, a result of a head-long rush to embrace new technology so fast. He also is asked a direct question as to whether Microsoft is more innovative than Apple, to which he explains some remarkable perspective that Microsoft has perhaps been working through serious changes to foster innovation over the past 3 years while Apple was busy "making a new iPhone" and “falling a little behind.” That prospect does worry “the Woz” as well, but also shares it in the context of times where Apple was stuck in a cycle of just improving products rather than re-inventing them. To round out the interview, Wozniak is asked for his thoughts about the changes in leadership at Apple, with the departure of Scott Forstall and John Broweet. Steve explains there may be more than just the issues of Apple Maps, but he is hesitant to offer anything concrete since he did not know them personally. He does shed insight to the late Steve Jobs and his personality in terms of what he was like to work with in contrast to the culture at Apple now. How can someone not love this guy!!!! Hes honest and not biased and he says what he has to say straight up. This is what someone who loves technology should be like. Unlike Apple users who are very arrogant and think that outside the Apple world of products there is nothing in the world. And Android users who name their PhoneArena profiles "androidornothing"! We can see MS dumps tonnes of money on WP. We can see Apple uses litigation to "compete" They have one thing in common: lack of ideas. When you lack ideas you will resort to what you have left. I love Woz! Do you even bother reading MeoCao? Your comments are always so unabashedly false... Even in this article (only a few scrolls away!) Woz mentions that Microsoft has been undergoing "serious changes to foster innovation over the past 3 years..." Seriously, if you cannot recognize the level of risk (and innovation) involved in the whole Windows 8, WP8, Surface, XBOX, unified OS strategy, you are not being at all objective. I love Woz for his love of technology and sincerity but that does not mean I agree with everything he says. What is the innovation of MS that Woz talks about? Translation from English to Mandarine and voice recognition technology. That is not innovation, Google has been doing it for years. What MS has been doing for many years now is looking at successful ideas from others and try to copy. Sometimes they are successful like beating PS at its own game. but that is not innovation. Surface is a inferior product to both iPad and many Android tablets. Unified OS? Windows Mobile was ditched, so was WP7. People are confused with 3 separate OSes: W8, RT and WP8. Look at WP8, can you tell me where is innovation? The central theme of WP and RT is live tiles, but live tiles are the poor version of widgets. MS also admitted they did not have time to include Notification Center into WP, and that again is copying from Android. No my friend, there's nothing like a idea from MS. What MS has become after years of monopoly is a giant, ineffective and slow COPYCAT. The recent strides made in translation is not what I was referring to when speaking of innovation. Although, improving accuracy by the 25-30% that they recently did in this area is a nice achievement. Innovation rarely means a brand new idea; it rather often entails new and improved methods of implementation that take a technology further than it reached before. By the way, Google didn't invent voice recognition technology either. Who did they copy it from? A unified OS is not something that happens overnight. It is also not the easiest transition to get users to make, as it is a significant change that requires education (as you noted, there is confusion there among consumers). Windows 8, RT, and WP8 represent a step in the direction of a unified OS by sharing the same kernel, along with similar UI. They are not, however, the final product of the years of planning Microsoft has been doing to achieve a fully unified OS. But this direction of making the PC, tablet, and smartphone operating system coexist in a more cohesive ecosystem is a huge undertaking that I would definitely call innovative and risky. You may not realize this now, but the future of consumer technology has a lot to do with ecosystem and compatibility with other technology you own. Live tiles are a rather smart implementation of widgets. If you recall, Microsoft used to make actual widgets on their Windows PCs (before Android, in case you think Android invented the widget). They moved away from it because widgets, in their current form, tend to be more clunky and resource intensive than necessary. If a live tile can convey the same information as a widget, and replace icons at the same time, it is once again aiming to achieve improved implementation in this area. It is modest innovation because it is a different way of implementing icons/widgets; whether or not an individual likes Live Tiles is another story. I don't really have to go far with the Notification Center to prove my point. The concept of a notification center has existed for a long time, and again Android is not the first to come up with the concept. You think it is innovative because you like the way they implemented it. That is precisely the point. The problem I see is that your vision of the landscape when it comes to Apple, Microsoft, and Google, is blurred by your affection toward Android, and hatred toward everything else. While I truly admire Google as a company for all of the cool and innovative projects they take on, that doesn't mean they invented everything they work on. I'll say it again, innovation is often times more about unique and improved implementation rather than entirely new concepts. Google didn't invent any of those things above that you seem to consider as innovation (voice recognition, widgets, notification centers); you just like the way they implemented it. For giants like Google and MS we should talk about global scaled, trend setting innovations and not small ones like you mentioned. MS has none of that big innovations. - Google is not the first to have translation and voice recognition technology but Google is the first to make the technologies freely available to all people, that where innovation is and MS is trying to copy it. - The unification of OSes you say is making WP8 and RT very inefficient. Android and iOS take about 1GB of disk space against 14-15 GB of RT and that's not innovation. Innovation makes things better not worse. - Information of live tiles is scattered and very difficult to manage so this is gimmick not innovation. For comparison in Android only few important applications need widgets, the rest can be managed by notification center and that makes thing much more manageable than with live tiles. MS did not invent widgets, Xerox did but the way Google implement widgets with notification center is big innovation. I criticize MS b-c MS deserves criticism. How many times MS failed with it's mobile strategy? MS in fact has much more experience than both Google and Apple in mobile. I really wanted MS to have some serious innovation with WP8 but I am left very disappointed. I believe that MS will fail again this time with WP8 and RT because MS did everything wrong: product features, timing, relations with OEMs, ecosystem... you name it. Maybe you are not convinced, so let's wait and see. I appreciate your last response and that's why I gave it a thumbs up. There are a few points in there that I agree with, and a few that I don't. The notification center is a big innovation in your book, and personally I'm a fan of it as well. I would like a notification center in conjunction with Live Tiles because, as you point out, it can be more manageable. That being said, Microsoft did bring a lot of cool little features in WP7 that can be considered innovation in the same regard. Take the People Hub for example - it's a built in contact list that brought more integration with social media, management of contacts and groups, etc. than the other platforms had at the time. Google started going in a similar direction after Microsoft released WP7. Another one could be considered the search function in WP7. It was the first phone I used that allowed me to do all of these things with the click of a button, and all built into and integrated with the phone: a Local Search for restaurants, events, stores, etc., a Music Search (functions like Shazaam), a Visual Search (bar codes, QR Codes, book and CD covers, scans and translates text, etc. ), and a standard web search. None of those things are new concepts, but they all were implemented in a unique and innovative way, in my opinion. Also, just for your information, Windows 8 RT takes up 6 GB of space, not 14 GB. 5 additional GB are reserved for recovery tools, which is honestly better to have than not to have. Anyway, this should be a pretty moot point considering storage capacities are continuing to get better as technology progresses. Nobody claims that older operating systems are better than newer operating systems because they were able to fit on 56 MB hard drives. While it would be nice to minimize storage, I'd rather take features and functionality over minimal resource usage. I honestly cannot accurately judge the timing and execution of W8 release. I think it is more of a long term approach that they are taking, and believe it is effective. Time will tell I guess. Well I guess 19 people don't appreciate a harmless nudge to the ribs. I thought the irony of someone named "androidornothing" complaining about bias in the mobile world was worth pointing out, but I guess it's all business around here. Seriously fanboys, don't take your sides too seriously, it's not worth it. Thank you. I appreciated it. I liked his comment all up until he said "Unlike apple users who are very arogant.." as if ALL Android users were such a humble delightful bunch. Woz is awesome and a true tech lover...this guy doesn't take sides and he is just concerned with better tech no matter who makes it. He is right to be worried about MS and Apple as they're out of ideas and Apple has lost sals and market share this year despite the launch of four new products! I'm Apple user and I must say, he is totally right :( This is what we scare for, and history is gonna repeat himself, Microsoft is going to eat Apple once again so we Apple fans remain silent to see the result... And no we are not arrogant!!! Apple may be a rare case of "too big to fail" actually being true. I, like Woz, like choice. I hope Windows Phone succeds and Blackberry comes back strong. I think Tim Cook is aware that innovation is needed badly, as Android has passed them in the phone world due to light years in advancements and are catching up on the tablet front. Seriously? how many Steve's are in the technology business?!?!?!? your comment started out good & ended terrible. i use Apple products but i'm a lover of technology, not brands. for you to categorize every Apple user is as ignorant & narrow-minded as you accuse those who are loyal to just one brand. The Woz is the man. He just loves technology like most of the rest of us, and he's definitely someone tech lovers should all listen to. Again, for the bilionth time, the engineered social role of "Woz" as a character within Apple that criticizes it, to prove the supicions of Apple haters that all of them are evil and that exception makes the rule! Um, yeah, go spew that conspiracy bs somewhere else. All accounts are that Woz is who he seems to be. If he isn't, someone give the man an Oscar for lifetime achievement lol. I'm not saying he knows that - it's a role ascribed to him by society and media. If you go on some research - you will notice that every single article about Woz in the last two years has something to say about him criticizing otherwise very illusive and consistent Apple's attitudes. Yeah, he has stated the obvious, which is as a company, Apple in the last two years hasn't done much to innovate, and has acted like a schoolyard bully via patent litigation. And to say that a man as smart as he is doesn't know what he is doing is an insult to him and his intelligence. If you can't agree with that, all you can say then is baaabaaabaaablahblahblah. I'm not saying if he is right or wrong, smart or stupid. I'm saying about the media role that is projected on him as a symptom of hate towards Apple. Every now and then there is a news about Woz saying something non-Appleish, to prove that there is a difference between true tech lovers and greedy businessmen, which is only a media theater that tries to constitute mythical battle of signs and symbols, not true state of things. Dear God man, no one is using that or talking about that here! The man is simply being applauded by posters here as a tech lover regardless of who makes it! If something is crap, he will say so regardless of who makes it, same as if something is cool he will say so regardless of who makes it! I'm done with this. I keep talking to you I'm going to have to go kick a puppy you are so frustrating. IT IS A SIMPLE STORY, SIMPLE POSTS, NO CONSPIRACY TO SEE HERE! MOVE ALONG! Yeah, and you carry on chasing goblins, the boogeyman, and other things that don't exist. Oh, and bigfoot too. Looking for things that aren't there. Paranoid delusional much? let's cut the bs. don't pretend that you android fans don't get satisfaction out of hearing someone who has worked in the industry express an OPINION that is similar to the android community. if Woz would of came out & said that Apple is actually an innovative company & other positive statements your posts would of taken a totally different direction. i'd bet my next 6 commission checks that he wouldn't be regarded as "intelligent" if he made statements that referred to Apple as a company who is making all the right decisions. You put Apple in any title of an article & android fans will flock to it to pick it apart (generally). PA certainly knows how to play the right chords. Some will some won't, it depends on the source. 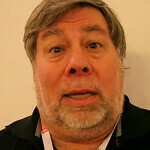 I have respect for Woz's opinions b/c he is a tech junkie without prejudice to the source of the tech. He knows more about technology than I probably ever will, and he says what he thinks. As for me, the ONLY reasons I get satisfaction about seeing negative Apple press are their arrogance and all the patent litigation over dumb stuff that has been written about many times over. I respect the tech that they are capable of making, but they, imo, haven't made anything truly innovative since the iPhone 3G. The iPhone editions since then have been simply marginal improvements imo. I think that Apple has lost some of its focus, for whatever reason. I am sure they are still capable of putting out some truly amazing things, but they haven't in some time. It is a fact that Android is evolving much faster than iOS. Android isn't for everyone, same with iOS, BB, and Windows Phone. Having choices is great. Uninformed, closed minded people would likely make you win your bet. Those of us that are informed and open minded would make you lose it.